I first heard the name, Anaïs Nin, from my future mother-in-law when I was 17 years old. The man I would later marry, Frank Aldridge, was born in Paris in 1933. His mother, who painted under the name of Frances Wood, lived in Paris for 7 years. Several years before Frank was born to Frances Wood and Frank McEwen (McEwen designed and ran The Rhodes National Gallery in Salisbury Rhodesia and is another story worthy of its own page) his mother was living with the painter, John Nichols when they met Henry Miller in the early 1930’s. Frances was one of the characters in Miller’s, “Tropic of Capricorn“. At that young innocent age when I met Frank I had not heard of the book, “Tropic of Capricorn” but learned that it was banned in this country and people could only read it by getting copies smuggled from Europe. My future mother-in-law frequently referred to “this Anaïs woman,” pronouncing her name, “An-eye-iss” the way most people still do. Whenever Frances talked about her Paris years it was still always with annoyance that Henry talked a lot about this mysterious woman, “An-eye-iss,” but would never introduce her. Frances Wood knew many of the other characters in the books of Henry Miller’s Paris days and she loved telling me her stories about them which fascinated my young and art starved imagination. I loved hearing about people who were tangent to the writers I read like Gertrude Stein, F. Scott Fitzgerald and Laurence Durrell. Some years later I discovered the letters exchanged between Henry Miller and Lawrence Durrell and devoured them with avid interest in their lives. Again, Anaïs’s name emerged and I wanted to know who she was. I didn’t get the opportunity until her first Diary was published in 1966 by Harcort Brace and World. Another Diary appeared in 1967, a third in 1969 and the fourth Diary in 1971. Several years after marrying Frank Aldridge I was living the life of the business executive’s wife, bringing up two children in Riverside, Connecticut, going to art school again, and exhibiting my paintings but never feeling I belonged in the culture. All that changed, and my life with it when the woman’s movement rolled into town. 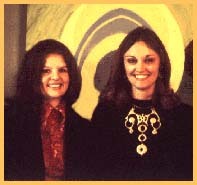 I celebrate September 25th, 1970, the day Suzanne Benton started Connecticut Feminists in the Arts and where I met, among many other artists, writers and musicians, Valerie Harms Sheehan. A group of ten of us started a consciousness raising group for women artists. We met for over a year, talking over women’s issues that until that time were not spoken out loud, let alone in a group. They were exciting times and along with our passion to re-create our lives came upheaval for all of us. With our agreement, Valerie recorded and transcribed these session that later produced the book, “Unmasking,” published by The Swallow Press in 1973, for which I designed the cover. Valerie and I argued over whether Diaries were literature or not. She had not read Anaïs Nin. One day I brought her all the Nin Journals that were published, telling her we could continue our argument after she read the Diaries. When she finally did read them – Bam! the rest is history! Valerie not only became a convert to the value of Journals but wrote to Anaïs. I realized how stupid I had been for never writing to Nin myself, not thinking she would be remotely interested in me. In those days the woman’s movement made us aware of the poor self-esteem we women had. So I am forever grateful to Valerie for having the good sense to contact Anaïs and for taking me with her for our first meeting when Anaïs wrote back and said that she would be in New York, inviting us to her’s and Ian Hugo’s apartment in New York City. We took the train into New York city and both got very dressed up, acting like sixteen-year olds going on a first date. We were nervous and arrived 20 minutes early and so had to stand under a canopy while a rain storm suddenly sprang up, feeling too silly to arrive so early. Finally it was time! Up the elevator we go. Ringing the bell. Anaïs opens the door! She looks fragile and greets us in a quiet formal manner. Anaïs’s hair is long and dyed a red-gold color and is combed up on top of her head. She is wearing dark eye make-up and very red lipstick. Her dress is black wool and long, to the floor. Her eyes are a marvelous open blue. She wears suede purple sandals which I admire. Valerie and I sit on chairs facing her, a table between us. Anaïs closes the blinds dimming the light as she creates atmosphere. The room itself is sparsely decorated but with three memorable pieces of art on the wall. Across from the couch is a display of copper engravings done by Ian Hugo which were the plates for the illustrations in some of her hand-printed books. On another wall is a display of these engravings printed on white paper. Near the doorway hangs a magnificent collage by the artist, Varda. We both thank Anaïs for giving us her valuable time and she tells us how crushed she was when she wrote her first fan letter and never received a response.
. . . We talked of feminism, wanting to know whether the groups talking today were similar to the nature of the one-on-one relationships of talk that Anaïs experienced in her Paris days. There’s some discussion of Laurence Durrell. I tell Anaïs how much her Diaries meant to me, having to always create my own art in isolation and feeling that her diary was like having a conversation with someone who might be interested. I try to tell her what a sustaining influence she was – that she told her story, her struggle. Anaïs tells us how women artists have always given up their art for their love for a man but that a man gives up his woman and everything else for his art. I ask Anaïs about her relationship with Henry Miller, noticing that in the Fourth Diary the two were estranged and wondered why. Anaïs explains how they were essentially two very opposite kinds of people and opposites eventually go their opposite ways and get further and further apart. She also tells us how she owes a debt to Henry Miller for taking her out of the suburbs and into the life of the city in Paris. We talked of fathers and Catholicism. I tell Anaïs my father has the same birthday as hers, February 21st. I was also raised Catholic. We both feel this to have been a destructive force in our lives. But Anaïs tells of the positive influence she had as a child of being surrounded by musicians and creative people. Her father’s library was available to her, from which she read many books as friends of her father’s directed her reading. She quit school and never continued formal education. I tell Anaïs about my Mandala Press and am thrilled to be able to give her one of the hand bound copies of NOTPOEMS. Toward the end of the two hours Anaïs asks us if we came into the city often. She seems to feel we have come so far to see her. We feel we are kneeling at the feet of our guru. We don’t care how long it took to get there? I am aware all this time how tiny and how human this woman is. I feel her vulnerability and strength as she emits these seemingly opposite qualities simultaneously. “Celebration With Anaïs Nin” weekend. The book, Celebration With Anaïs Nin, tells what took place at that memorable weekend. It’s also an interesting coincidence to me that April 28th is Frances Wood Aldridge’s birthday. Because Frank and I were separated at that time, a fact she was not happy with, and probably out of a little jealousy regarding Anaïs, the woman she had never met and I was honoring, Frances did not come to the weekend. It was a privilege and a turning point in my life to be part of the creation of Celebration With Anaïs Nin, the historic weekend of April 28, 29, 30, 1972 and the book that commemorated it. Following the Celebration weekend Valerie and I started Magic Circle Press in the attic of my house — exciting and productive times. Since the death of Anaïs Nin in 1977 and the subsequent publishing of her unexpurgated Journals and biographies it is commonly agreed that she was an extreme narcissist. I question the implication of the derogatory meaning of that word. Certainly Anaïs Nin was narcissistic but how can any of us who keep a Journal not be called that? Just the fact that one writes to one’s self is an act of narcissism. So given that this is true, I want to emphasize that one can be narcissistic and also be a generous person to others. Anaïs was an exceptionally generous person – financially, emotionally and spiritually generous. One can easily see evidence of this with all the documentation of how she nurtured Henry Miller (and others) in every conceivable way. That which stands out most about Anaïs’s essence is this generosity. When I met her, in awe and appreciation of who she was, I felt personally responded to by her. This personal generosity of spirit was a gift that has remained with me always. When you love someone nothing any one says about that person, even they themselves, make you love them less. I will always love her – who ever she was – and there were many Anaïs Nins – one for each of us. What more could one want from another? 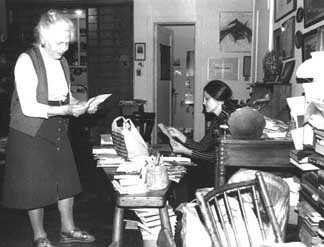 Frances Steloff & Adele Aldridge, Gotham Bookmart, 1973.